So recently installed some manual CCTs on my 2nd motor on my 98 in bike now. The motor is an 05. After the install I had an issue with the rear cylinder not firing. No real reason for that it seems. I have cbr coil on caps so just pulled it and reinstalled & it then fired. Now I have a weird sort of an electronic stutter it seems. It runs & idles perfectly except every so often it misfires and stutters, and may even stall. I tried swapping in a different rear coil but it acted exactly the same. Anyone seen this? Its not heat related since it happens at all temps. Its not a carb fart or at least not the type the bike has had previously. Those would judder the whole motor. This just seems like a missed spark. Any ideas anyone wants to throw at me? My first try at coil on cap, I left the modded and swapped on rubber part a little too long (there is a bad joke there someplace) and the coil would pop off the sparkplug causing a misfire... once I trimmed the rubber sleeve about another 1/8" never happened again. Perhaps you have a wiring issue, the coil wires you worked with, insulation rubbed though and it occasionally grounds out? Broken or corroded wire in the coil wiring? pin in the coil plug broken or backed out of the housing? So removed both coil wires (which of course are spliced cbr plugs onto the vtr plugs). I checked them and covered each one fully with durable heat shrink.to be sure they don't ground to anything including each other. Not sure it helped but I did find some perished rubber that I used to build the boots so rebuilt them again. Some other questions. Does it matter what order the wires are in off the coils? meaning they are not any polarity but just a pulse to make it spark ? Also, there is a plug in the rubber boot at the front of the seat with a bunch of plugs. One plug is 2 parallel blades and one perpendicular. It was pretty warm/hot. What does that go to? Not remembering right now. That sounds like the speed sensor or is on my bike, but I changed some connectors to sealed type so may have the guess wrong. So whats my next step? Ive made sure of no wire issues from harness to coils. Swapped on differ coils to eliminate them as suspect amap. Then next step is the black box right? Or could it still be a carb fart? Never had one of those stall it and its really acting like a spark cut out every few minutes. I was going to do the fuel screws next or maybe watch a voltmeter on the battery while it runs to see if there is a power loss at the cutout instant. IIRC that is the feed from the stator to the RR. I would keep an eye on that! Ahh, been so long since I had one of those I did not think of that...And bet your correct. Look like this and have three yellow wires? If so yes that is the stator plug and the hot is caused by excess resistance. But if your keeping it, clean those terminals and use a bit of dielectric silicone when you plug it back in to ward off some corrosion and water/dirt. That is pointing to a coil power issue still...perhaps not the coil itself, but the wiring. intermittent wiring issues are the hardest to diag as, you cant find what is not there...mostly .... You can but you have to wait till it faults and test at that moment, or you just systematically check everything it can be and blunder into the issue. I would take the time to check your coil wiring, from plug all the way to and a little past where you connected that to the OEM wiring. as to carb fart... is this cutting out only happening at idle? that the only time Ive seen a carb fart cause stall. Yes so its only at idle and I cant be sure its a carb fart or a coil falter. I re wired the coil and can replace them but it still does it. I will follow the wires past where the oem plugs are cuz yeah that could be it too. I am still thinking its a spark issue but it does sorta act carb farty which I still think a thorough carb cleaning is in order just to rule that out and check the diaphragms. I don't mind replacing pretty much everything along the way since its a 98 and more new parts make me happier and are cheaper than a new bike. 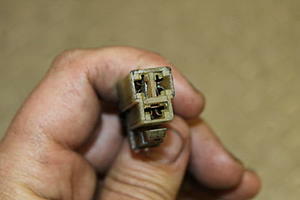 So current plan is to eliminate the plug by soldering the connections. I have an R1 RR in there now with good quality eastern beaver plugs. Changing the plugs helped it recover better from the cutouts but it still falters. Had to go racing in Loudon last weekend so vtr had to wait. Then had to do brakes on the truck so same thing. Erik, do you think it could be a black box issue? Should I swap that to see?. Interment issues are the WORST to track down as you often cant diagnose them unless happening. You got rid of the oem alternator wire plug didn't you? I removed the 3 pin connector and just soldered the wires together to eliminate that. I changed the spark plugs. That helped it not stall when it cut out. Today I cleaned the carbs very well. As I was tearing it down, I found that the front cylinder vacuum port was open to atmosphere. This due to me having a tube on it to do a carb sync a while back. Then vacuum cap sealing it had perished due to ozone or other causes. Now it has no weird cut out but the idle seems to fluctuate. I also put the thumb fuel screws in (finally). I have them set at 2 turns out from full in. I am thinking the choke is being weird since when I reached in to adjust idle, I moved the choke cable and it varied the idle quite a bit. That will be my next thing is to look at the choke issue. Here is a video of my current idle situation. It is the strangest idle ever in years of having this bike. It is pretty solid but for one it rises and falls as it idles. But here you can hear that it kinda puffs every few seconds. Have you deleted the PAIR system? Yes pair is long gone with no ill effects. Wondering if maybe loose carb collar or airbox hoses open to atmosphere. Air leak in the intake / exhaust system? open leak in vacuum takeoff ? - you mentioned somewhere else that plastic choke fitting is broken? Yes I've got a pair of gl_s_r's (still to fit sometime). Their position on the VTR and Aftrica Twin is quite ensconced even from British winter road salt. Age seems to cause the original ones placcy to go brittle rather than purely enviromental exposure. That causes the carb fart every so often. Not what is in the vid, that was fixed today when I installed the Polaris choke things I found in my parts box. I was mad but we did remove the head and get the chain back on track at tdc & installed the cct. He thinks we coulda bent the valve a touch. BUT...…..big BUT...…..I did solve the prob accidentally when the chokes were broken causing it to run way rich. So now I turned out the new thumb fuel screw to 3 turns out in the front and it seemed to help. Last edited by smokinjoe73; 06-04-2018 at 08:02 PM. 3 turns out on the front is a bit too rich. It causes crazy popping on decal which is just too loud to leave. Also the front cylinder does carb farts even when riding which it rarely did before. I am betting if I just make the front richer it will help a lot. If you think you may have bent a valve, STOP running the motor... Replacing some valves is cheap compared to what is going to happen when that formerly two piece valve, now bent, becomes two pieces again ... You are going to damage cylinder, piston, rod, head..if that valve comes apart. Do a leak down test, or compression, or remove valve covers and measure valve clearances. Last edited by E.Marquez; 06-05-2018 at 04:30 AM. Check out this Superhawk!! pretty weird!